How about this? Two posts in one day? Well,this one will get me updated to real time – as in this morning. 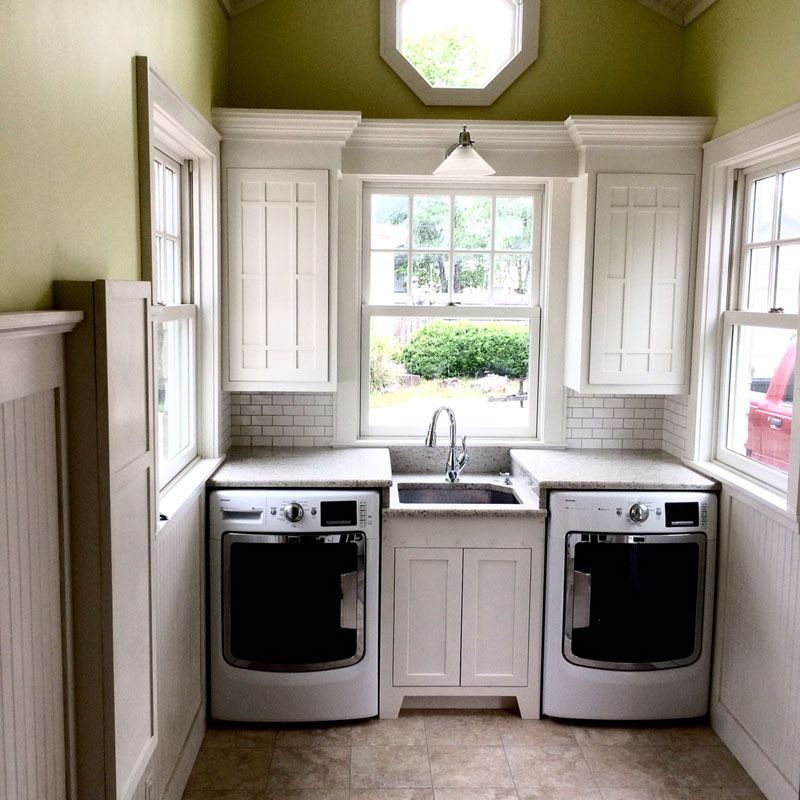 I was happily painting cabinet doors at 3:30am today, and got most of the Mudroom projects completed – so why not get this post out of the way. 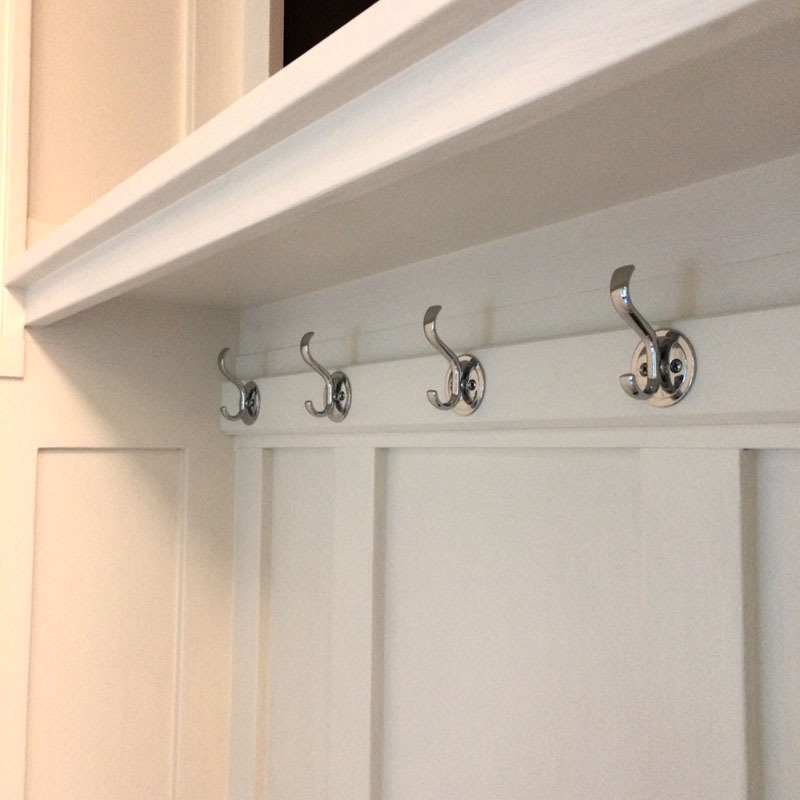 One item added was a rail and coat hooks above the shoe storage bench. We left the mudroom like this for the past few years. 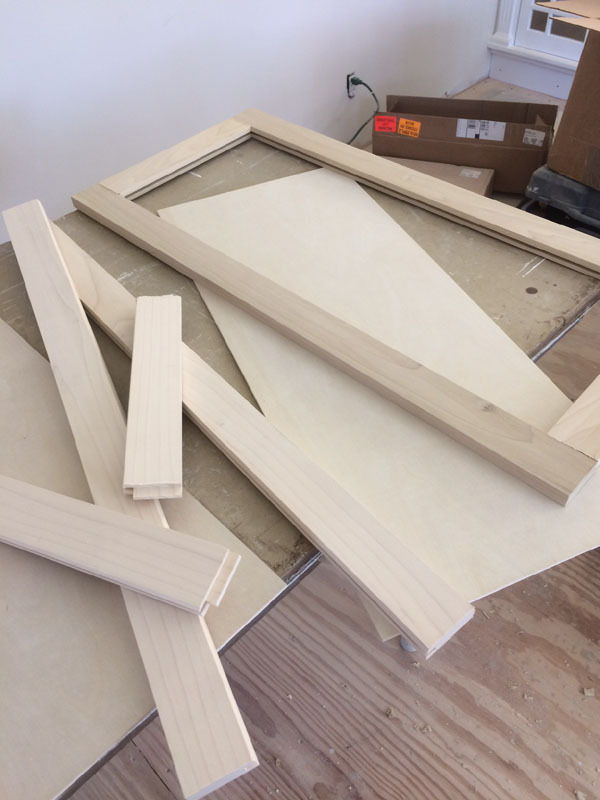 Looks like we need to make some cabinet doors. First things first. We have to clean this place up! It’s a little tricky, so I decided to make another half-a**ed scaffold. No issue with falling off and being wheelchair bound this time. 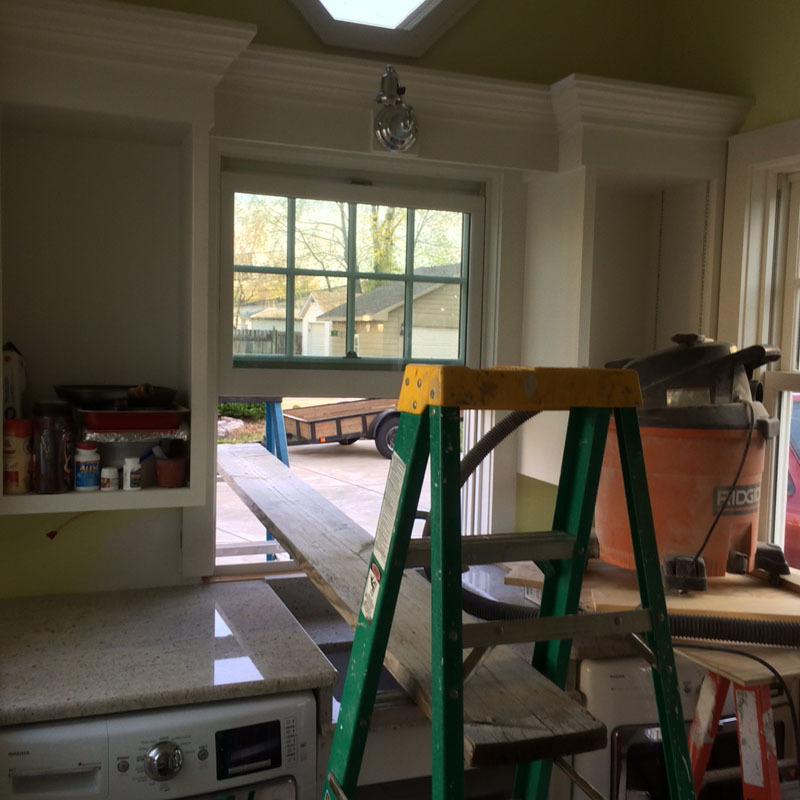 It was the only way to get to the tops of the cabinets and window without risking breaking the granite counters. 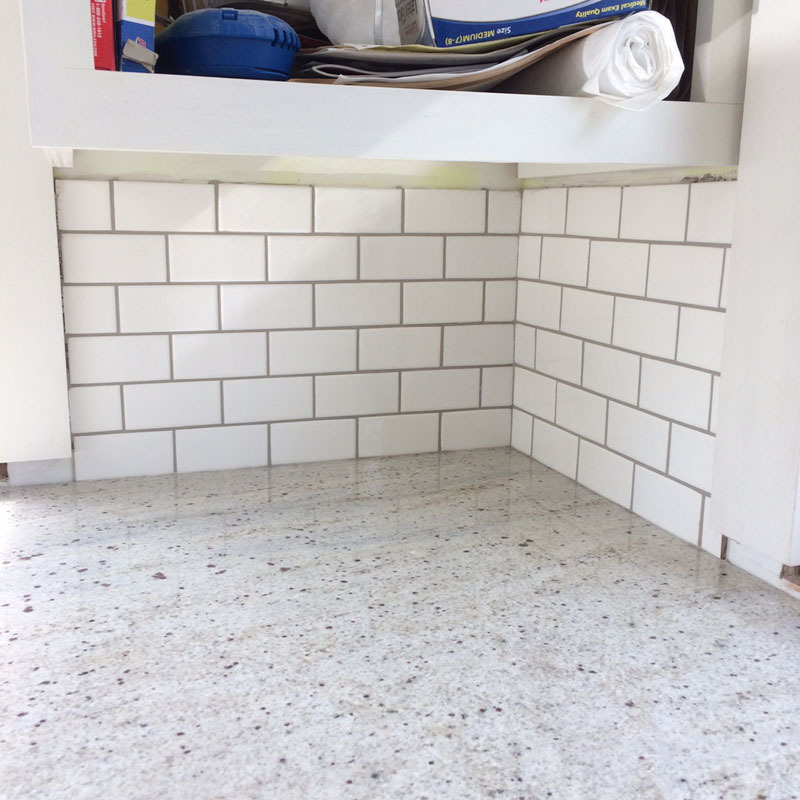 I used a small scale white subway tile for the back splash. The left side has an electrical feed for a receptacle. This whole circuit is on a gfci line as required by code. 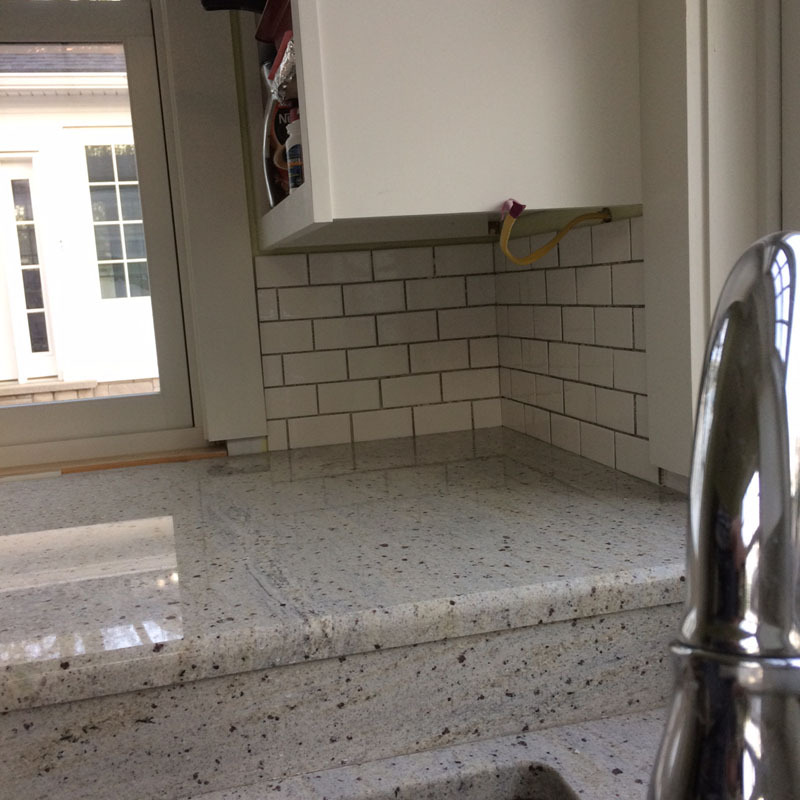 I used a light silver grout to match the lighter tones of the granite. 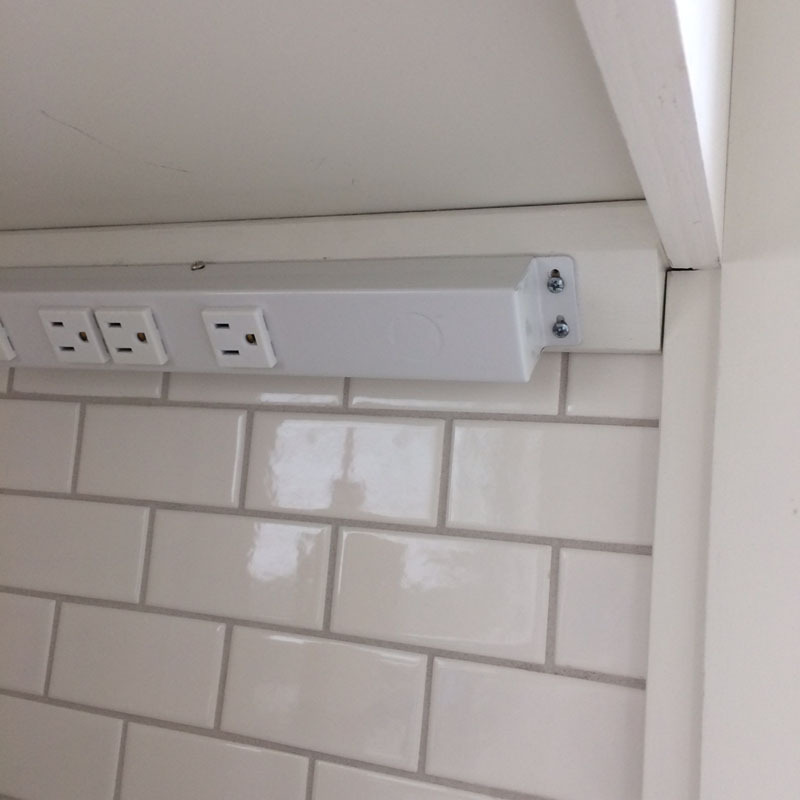 I cut an angled block to mount the 4 socket receptacle – the angle makes it easy to plug in appliances or whatever. I didn’t like those exposed screws used to mount the power strip. So I made a couple of covers that fit over the mounting tabs to make it look more built in. 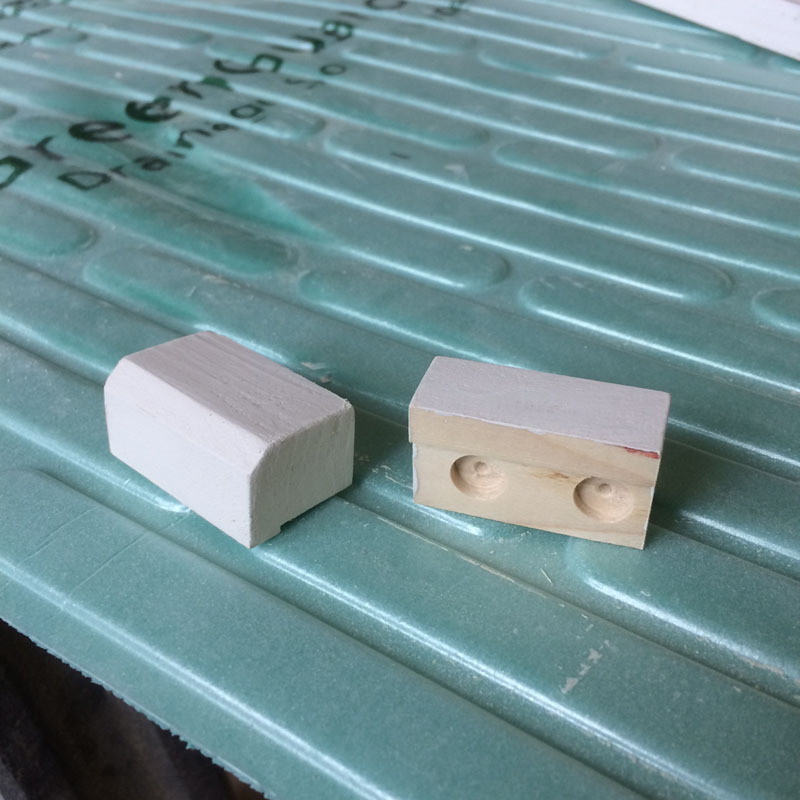 Now we get out the stile and rail router bits to make the cabinet doors. 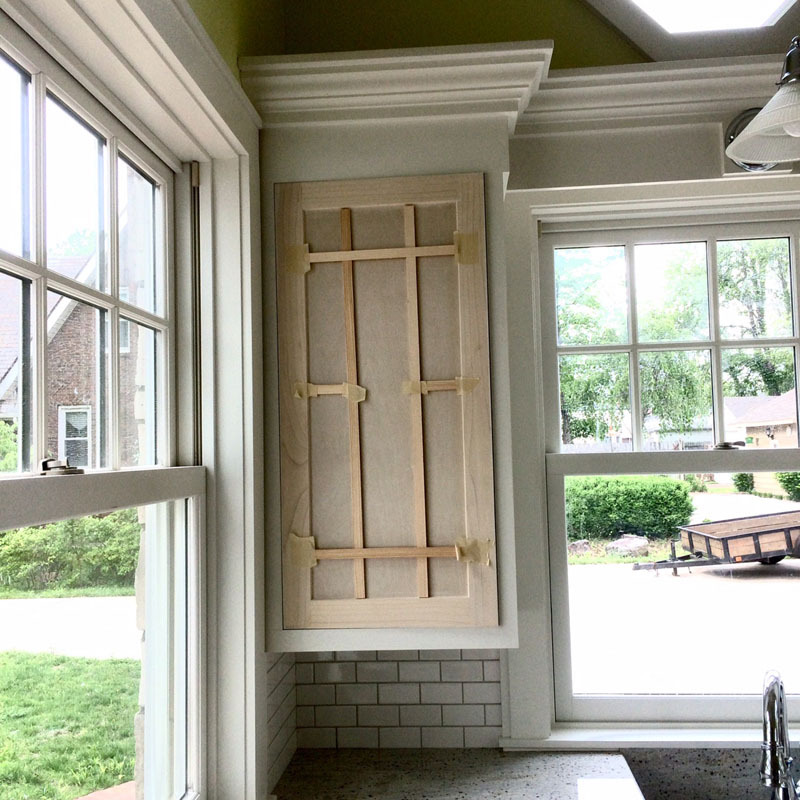 The first fitting of the doors. 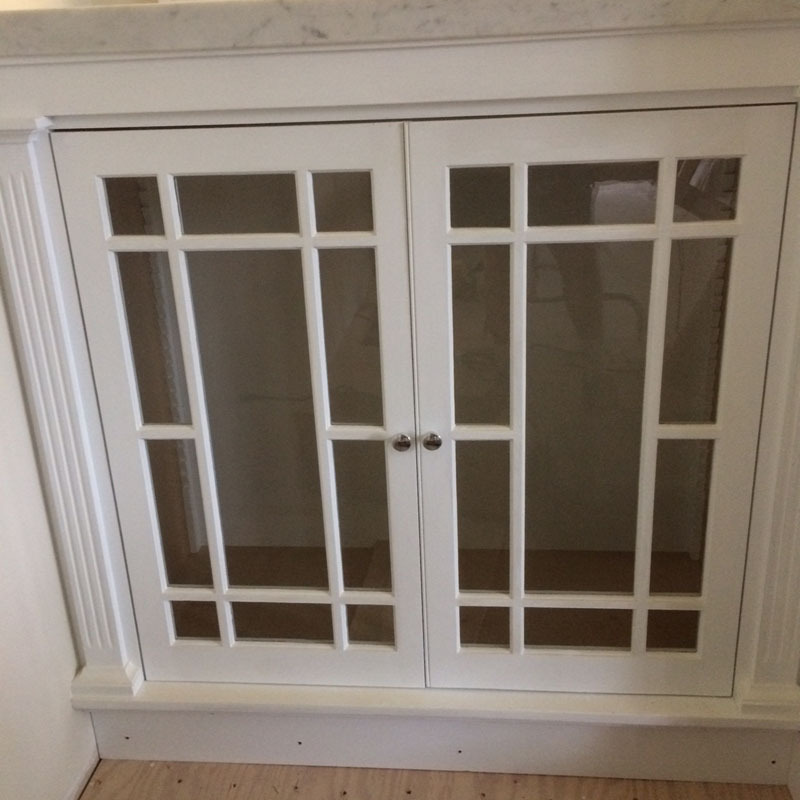 I made them inset, like the rest of the cabinets I’ve made. 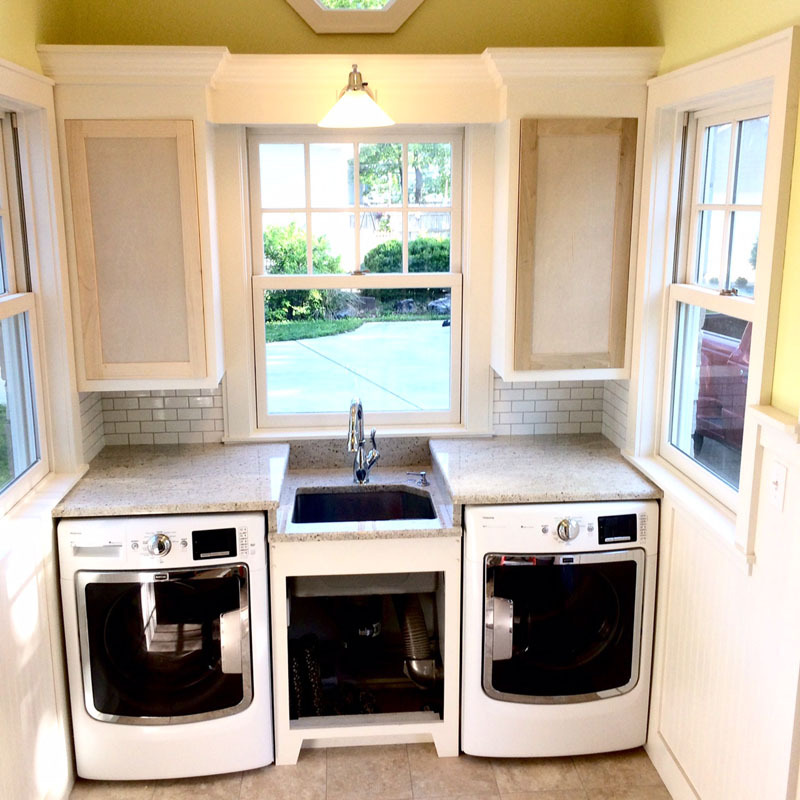 All of the trim around the tile and windows was fabricated and finished. 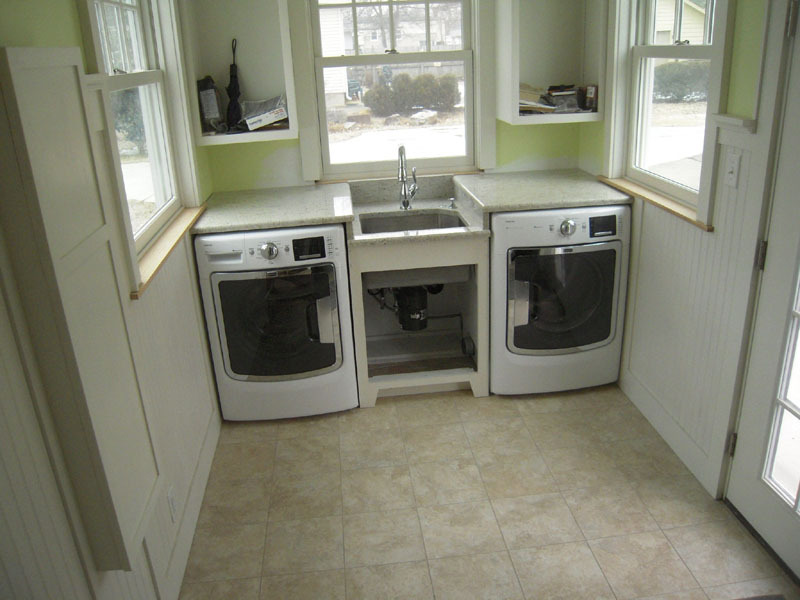 The cabinet doors are 40″ tall, so they looked a little bland. So I took some inspiration from the original cabinet doors that flank the living room fireplace. 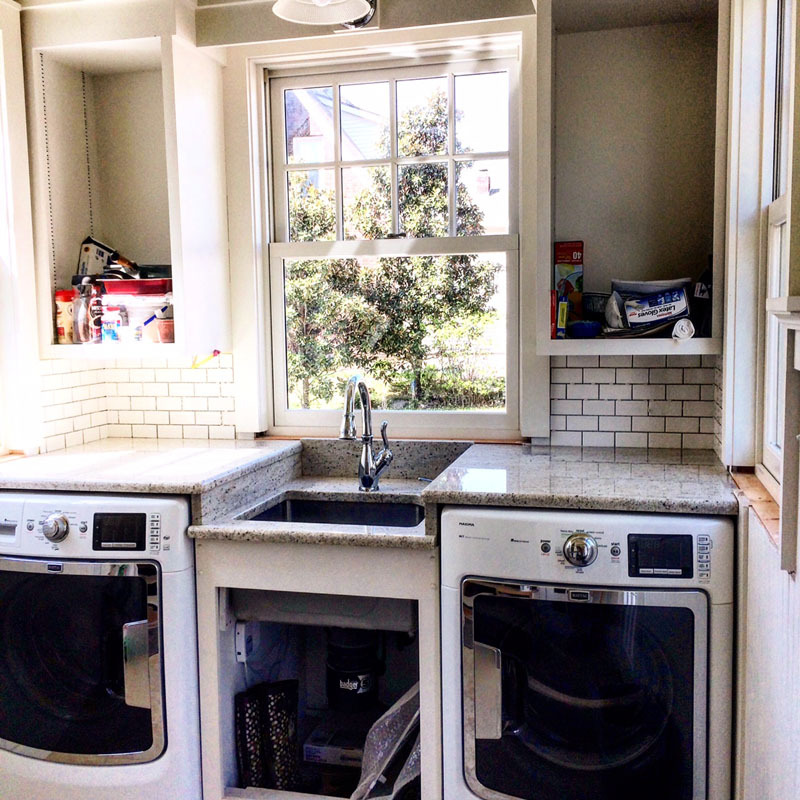 I wanted to avoid glass doors in the mudroom, as I didn’t want to see boxes of laundry detergent every time I walked in the room. 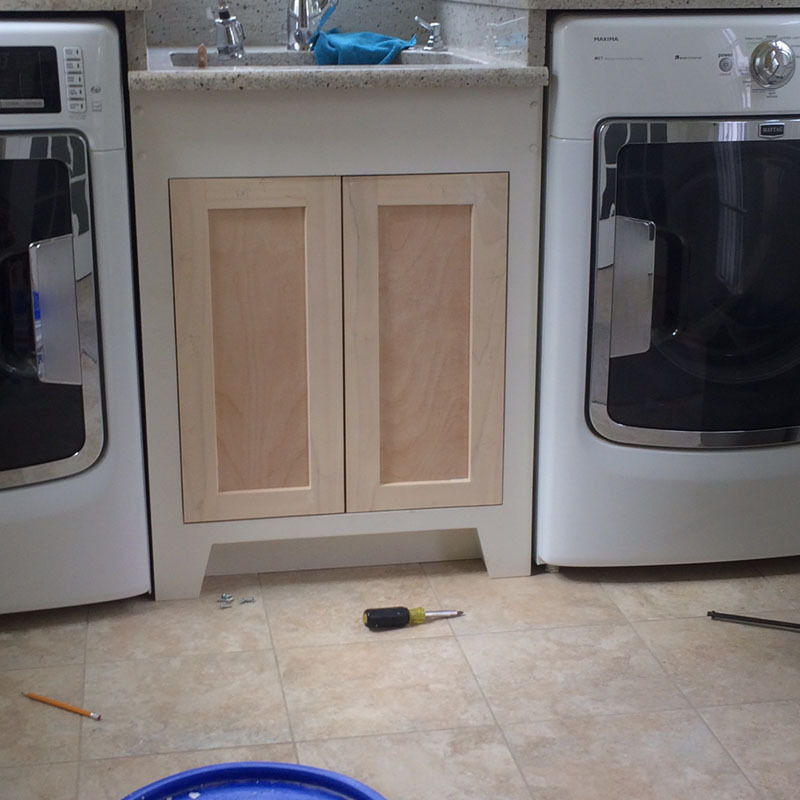 While I was at it I made a pair of plain shaker doors for the sink base cabinet. So I painted the doors and got them back on their hinges by 8:00am this morning. I need some doorknobs. Hang in there – more to come. But not today.